In response to the need to take new approaches to combat the illegal trade more effectively, the International Consortium on Combatting Wildlife Crime (ICCWC), at the request of Sri Lanka, deployed its first Wildlife Incident Support Teams (WIST). The WIST was aimed at collecting DNA samples from 359 elephant tusks that were seized by Sri Lanka Customs authorities in the port of Colombo and was in response to a Decision adopted by the Conference of the Parties to CITES at its 16th meeting (CoP16), held in Bangkok, Thailand, from 3 to 14 March 2013. The Decision called for the establishment of WISTs, consisting of enforcement staff or relevant experts, to be dispatched at the request of a country that has been affected by significant poaching of CITES specimens, or that has made a large-scale seizure of such specimens, to assist it, and guide and facilitate appropriate follow-up actions in the immediate aftermath of such an incident. The DNA samples collected by the WIST, which was led by INTERPOL on behalf of ICCWC, will assist relevant national authorities to determine the origin of the seized ivory through the use of forensic technology. Identifying the areas where ivory seized during large scale ivory seizures originate from is vital, for the design of efficient law enforcement responses and interventions. This will ensure that resources are directed to those areas where the most significant poaching activities occur. Determining the origin of seized ivory will also make a significant contribution to ensuring that the entire crime chain, from countries of origin and transit to the countries of destination, is addressed. John E. Scanlon, Secretary-General of CITES, stressed that "the successful deployment of this wildlife incident support team (WIST) in Sri Lanka by INTERPOL demonstrates the hands-on support now being delivered to CITES Parties through ICCWC". “Large illegal shipments of ivory, such as the one seized in Sri Lanka, are often an indicator suggesting that organized crime groups are involved. It is imperative that follow-up investigations and prosecutions, especially targeted at the ‘king pins’ behind organized criminal syndicates, are conducted. The effective use of all available resources in the investigation of transnational organized wildlife crime, including through the use of wildlife forensics, is crucial” added Mr. Scanlon. The samples have been sent for analysis to the Center for Conservation Biology at the University of Washington in the United States for DNA analysis – to identify the origin of the ivory – and to the German Federal Agency for Nature Conservation for chemical isotope analysis, to determine the age of the ivory. 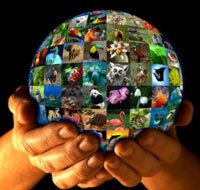 ICCWC is the collaborative effort by the CITES Secretariat, INTERPOL, the UN Office of Drugs and Crime (UNODC), the World Bank, and the World Customs Organisation (WCO) to bring coordinated support to the national wildlife law enforcement agencies and to the sub-regional and regional networks that, on a daily basis, act in defence of natural resources. The deployment of the WIST was generously funded by the European Commission under a project managed by INTERPOL on behalf of ICCWC.